The Autumnal Equinox celebration has come & disappeared so quickly. This is a Spooktacular Autumn Season with Halloween Magick in the air. Lady Lyndy's seasonal Autumnal Equinox Topic(s) are right on the money: THE TRUE MEANING OF OOAK ART WORK TO THE SPOOKY FINANCIAL CRUNCH FOR EVERYONE, ESPECIALLY STARVING ARTISTS. I've been told that my black cat art work is not OOAK, because I painted a similar black cat with a moon from a vintage Halloween postcard that was published in 1910. My art work has different colors, extra black cats & painted on a wooden plaque. Is this OOAK or not? Yes your art work is OOAK. If you created an OOAK work of art from vintage postcards or vintage Halloween decorations from before 1923 than you created a OOAK work of art. No artist can lay claim to vintage postcard/decorative art that is out of copyright. 'Vintage Style' is today's Halloween art work. I painted an original Halloween black cat with witches art work from one of my peers idea in a different medium. I added some minor changes to the format. Is this OOAK? AND you really are, actually I'd say you're a COPY CAT Artist! Your Halloween black cat art work is not OOAK! If you copied exactly an OOAK work of art from one of your peers either in the same medium or different medium with some minor changes than you have committed copyright infringement. I've used stencils that were custom made for me on my Halloween art work. Every art work is different. Never the same twice & I add depth to the stencils so that they do not look like any stencils have been utilized. Is using a custom made stencil considered OOAK? The funny thing is even if you used custom made stencils for your artwork, but added more than 50% to reflect your own concept in most OOAK Art World's this is still considered Original. OOAK means Original One Of A Kind, meaning not another exact art piece was created. It should be stated on the COA or art sale/auction that you have custom made stencils that you have incorporated on the art work. (These rules are used when the artist is you & not interpreting another's art work). * An exact blue sky art piece & a red sky art piece would be considered OOAK. * An exact black cat on a bowl & the same black cat on a plate is not OOAK, it must have added embellishments. * Different brush strokes or acrylic VS. water color on the same exact piece on different mediums is not considered OOAK. * Larger VS. smaller on the same exact piece is not considered OOAK. * Different colors is considered OOAK, but really should have different embellishments. My husband was just laid off & I'm a starving artist. I was wondering if I should quit creating art work & get a real job? First & foremost I'm so sorry about your husband losing his job. If you have to get steady employment, than you should. AND so should your husband. In today's failing economy any employment to help make ends meet is imperative. You should never give up creating your art work. This could be considered a second source of income through Internet sites like eBay auctions & online stores or listings like Etsy. Every little bit helps to pay the bills. Are you still buying OOAK Halloween black cat art work for your collection or black cat art books? If so, what were your October 2008 OOAK Halloween art work purchases? How many OOAK Halloween black cat art works have you invested in & how long have you been collecting? The economy has caused us to budget our investments. Nevertheless, I'm always collecting OOAK Halloween black cat art work with more discernment. As for my Halloween Black Cat Art Book, yes I'm still adding a few more beautiful black cat pieces. My collection has grown to over 250 black cat art works & I've only been collecting OOAK Halloween black art work for 2 1/2 years. Looking forward to the Winter Solstice & your questions received through blogging comments &/or email. LADY LYNDY SORCERESS OF LIGHT is an advice column on COLLECTING ORIGINAL ONE OF A KIND FANTASY BLACK CAT ART WORK & HELPFUL TIPS ON KINDRED TOPICS. Wonderful insight about art Lady Lyndy! AND...thank you for taking home my little ACEO and for being such a fabulous Halloween art collector and advisor!! Love the new black cat pieces - I'va's work is just amazing, and as you know I got to see Joyce's "Magic" in person - lucky you to have such a treasure!! I just know "Magic" will love her new home! Hi Iva, thank you too. You have been a thoughtful kindred friend. Your art is delightful. Hi Chris, you are thoughtful kindred friend & fabulous artist. I'll add more Halloween art to this post when I catch my breath. Hi Carolee, Iva & Joyce are wonderful artists. I'm so glad to have their art work for my Halloween black cat collection & my art book. I'll add more OOAK Halloween art to this post when I catch my breath. 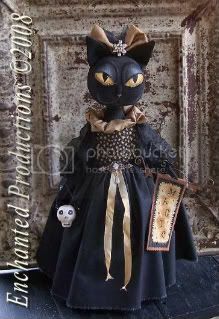 Hi Joycee, I'm thrilled to have your beautiful Halloween black cat doll 'Magic' for my collection & art book. You truly are a kindred friend & a spooktacular artist. Thank you too for your well wishes during the fire storms. We're finally home from the Mandatory Evacuation & exhausted. I will write a new post about the fires & how amazing the fire fighters were. PS: Glad you & your family are OK! THX again for all the SPOOKTACULAR HALLOWEEN wishes. Love your black cat card. Hope you had a HAUNTED HALLOWEEN too!!! THX for stopping by. I love ALL my beautiful Halloween art treasures too! Hope you & yours had a HAUNTED HALLOWEEN!!! 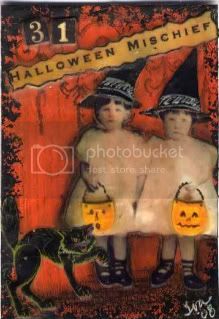 Lyndy ~ Glad you enjoyed your card & hope you had a great Halloween too! I will stop by and visit you there soon. PS: I'm VOTED & it feels SOOO good! FUNNY pic at the top!! !